A Doberman continues growing in height until it is one year old. 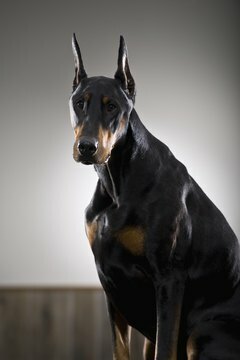 A one-year-old Doberman is considered a full-grown adult dog. However, the dog will continue to mature and fill out until it is two. While the female Doberman reaches its prime between two and three years, the male is at its prime when it reaches three years of age. Dobermans live for an average of 9.6 years. The adult phase is from one to seven years of age, when the dog is most active. Dobermans are born with their eyes closed and have creased ears. Puppies nurse at least every two hours, during which they take small amounts of milk to sustain their metabolism and growth. When the pups are three to five days old, their tails are docked and dewclaws removed. The resultant wounds are sutured. However, not all pet owners dock the tails of their pets. At 4 weeks, the puppies can be introduced to solid food. This is when you may see “baby teeth” appearing in their mouth. Dobermans can be weaned from after they are six weeks old, when they begin eating solids independently. They start growing taller and heavier after this phase. Ear cropping is a common surgery in this dog breed. It is performed by a veterinarian when the pup is seven to 10 weeks old. In this surgery, a portion of the outside part of the ears is cut off and then sutured and taped over the head. It takes about 10 days to heal. After the healing process, the ears are rolled and taped to train them to stand erect. However, ear cropping is not performed on all Dobermans, since it depends on the pet owner. The teething process starts when puppies are about 12 weeks of age and continues for about three months. During this time, they lose their baby teeth and develop permanent ones. It is normal for them to swallow their baby teeth. Provide edible and safe items, such as pig ears, real bones and rawhide, for them to chew on. Make sure that they do not swallow them. Schedule three feedings each day during the teething process. Dobermans eat only twice a day after they become 6 months old. However, you can give them biscuit snacks between the two meals. During this time, keep a close watch on the dog, as it should be neither too thin nor too fat. If you can feel the ribs when you push the sides, your dog is the right weight. You will be able to estimate the height of your dog at this stage. Usually, a Doberman puppy is around half the height at 6 months that it will be as full-grown dog. Females reach their final height when they are a year old, while the males continue to grow for one more year. The correct height for a full-grown male is 27 1/2 inches at the withers, and for a female, 25 1/2 inches. The wither is the highest point of shoulder. The height is measured from this point to the ground.